More than 20 years experience in Live Production and Concert Crewing. Phill has worked as a Promotor’s Rep, Tour Manager, Production Manager, Stage Manager and Crew Chief both nationally and internationally for most if not all of the clients listed. Phill has a vast and broad knowledge of the live music industry. Phill brings a hands on approach to the floor as well facilitating clients needs in the pre production process. Over 25 years working in the Entertainment Industry, Victoria worked many years as an Assistant Editor in Magazine Publishing before beginning her career as a Producer/Production Manager in Film in 1994. Victoria started full time with Showcall in 2005. 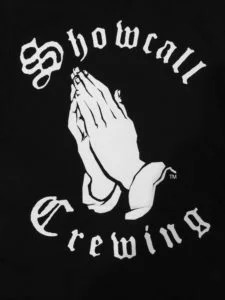 Sean is a foundation crew chief for Showcall Crewing. Sean has worked continuously with Showcall since its inception and has grown with the company to become one of the most highly respected Crew Chiefs in NSW working on over 4000 shows. Sean has toured extensively for Showcall both nationally and internationally as a Drum Tech and Stage Manager. His skills as Crew Chief includes Live TV shows, Arena shows, Stadium Shows and the biggest Music Festivals Australia has had over the last 12 years. Sean is also part of Showcall’s work safety team performing the vital role of inducting new and serving crew under the current national WH&S platform helping to ensure that all current and new crew are fully compliant with national industry work safety standards. “Rad” has been in Concert/Theatre crewing for 14 years and has been with Showcall for 12 years. Nathan leads Showcall’s crew with a respected and well rounded approach to concert crewing.Nathan’s Skills have been deployed State wide as a reliable all rounder owing to his experience as a forklift operator and FOH and Climbing follow spot operator. Rads skills have been widely used by clients to Mentor unskilled Labour in remote regions for major productions and maintains a vast understanding of WH&S.